Our This Week in Co-Op series has run since almost the site's beginning and during that times we've seen it evolve through a few different styles and subjects. The next batch of articles we decided to do an "assignment" - play co-op with public players and report back on how it goes. The online gaming public gets a bad rap - especially when you play with "randoms." Whether its potty mouths, verbal abuse, or incesant singing - there always seems to be something not so nice. 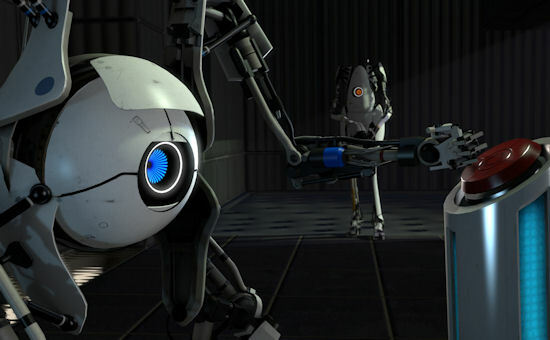 I decided to give Portal 2 a spin via Xbox Live to see just what the great wheel o random would turn up. What's funny with Portal 2 is when you got select a public matchmaking session, the game flat out warns you that you will have more fun playing Portal 2 with friends than you will some general person online you've never met. I started to get nervous - perhaps I should choose another title. My first match took me with someone who didn't even have a mic - so I followed him around a bit while we did goofy emotes for 10 minutes. We went from the hub room to the last set of levels - it appeared he needed to complete some puzzles yet. Thankfully - even without a mic - we were able to communciate thanks to the game's ping tool. We wrapped up a few puzzles with relative ease and I tried not to reveal the solution too much, since I had already completed them. After that match I tried my luck again - this time joined with someone who not only had a mic...but enjoyed hearing himself talk. Once again we headed to the last levels to wrap up some puzzles for him. He was clearly a high school student and talked to me about his math and physics classes and related some anecdotes about utilizing that knowledge in Portal 2 to help make things easier. I told you - he liked to hear himself talk. We worked well together - though it seemed my partner wanted to give the orders rather than "work together" when I suggested soem solutions. It was a mild annoyance but it was better than being harassed about my shortcomings or sexual orientation. All in all there were two successful sessions with some random folks online. Perhaps it was the game, the nature of the game, or the simple fact that it was co-op - but whatever the reason you can survive online with random players.